Fifteen vintage preset sounds, including oddities like Panpipes and Vihuela • Full manual mode with LFO, filter and amp envelope controls to tweak the presets or start from scratch • Preset waves can form part of complex layered patches in manual mode • 27 factory patches to get you going! 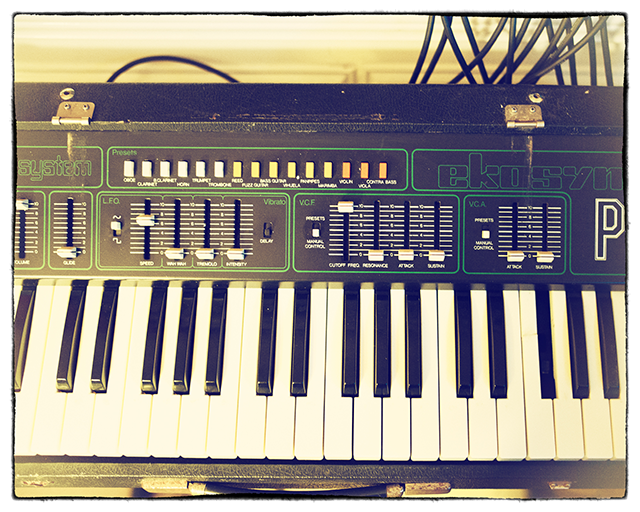 Dating from the very end of the 70s, the EKO P15 is a rare and quirky Italian analogue which blurs the line between a preset machine and a properly controllable synthesiser. It has 15 pushbutton presets (hence ‘P15’), but these are joined by LFO, VCF and VCA sections with much more promising-looking sliders and switches. In practice, the LFO is always freely tweakable, while the VCF and VCA can be switched between Preset mode (in which case they don’t respond, because behind the scenes their settings are being determined by the Preset you’ve currently called up) and Manual mode (in which case you can adjust them to taste). It’s a rather fun system, and while there are obvious limitations – only Attack and Release on the envelopes, for a start – it can be a quick and effective way to get at basic sounds. It’s also a laugh to see just how unlike their namesakes the Presets sound: Panpipes is particularly un-panpipe-like! There’s a three-and-a-half octave keyboard built into a sturdy tolex-covered carrying case, some really lurid green silkscreening (which I’m afraid we’ve imitated… just couldn’t stop ourselves) and, rather optimistically, a legend that reads ‘Digital System’ in the upper left of the panel… which is just a big fat lie, really, since the whole keyboard is analogue from start to finish, even if it does use newfangled ICs instead of transistors. We’ve kept very true to the original in our recreation of the P15, and so long as you keep the Presets Active button engaged and the polyphony switched to Mono, it’ll sound and behave just like the real deal. But we made two big improvements that really broaden its capabilities beyond the original’s limits. The first of these is polyphony, which is now a button-press away: suddenly all those presets can be playing chords, which is rather glorious, especially since the analogue impurities and uncertainties stack up and add some warmth. The second is that, if you turn the ‘Preset Active’ button off, you can now not only tweak the various sliders, you can also engage multiple waveforms (by clicking on several Preset buttons), which thickens the sound dramatically. It’s easy using this to dial up a full string section (instead of having to choose between Violin, Viola and Contrabass), or add some Trombones to some Horns for a nice brass pad, and then adjust the envelopes and filter settings for the whole batch of waves en masse. In fact, suddenly the P15 seems to come to life, with a quirky and pleasant vintage character all of its own. Its typical sound is quite rounded and mellow, with a smoothness we’ve come to associate with Italian synths and string machines, but cranking up the resonance adds some bite and, just for fun, we’ve added in a Drive knob on the front panel to push the sound a little harder. You can leave this bypassed for an authentically vintage tone, or add some extra harmonics if you want to make things edgier. Round the back, of course, there’s a batch of effects comprising Chorus, Phaser, Reverb, Echo and an Amp Cab simulator, so you can get the P15 to sound swooshy, swirly, echoey or raw. 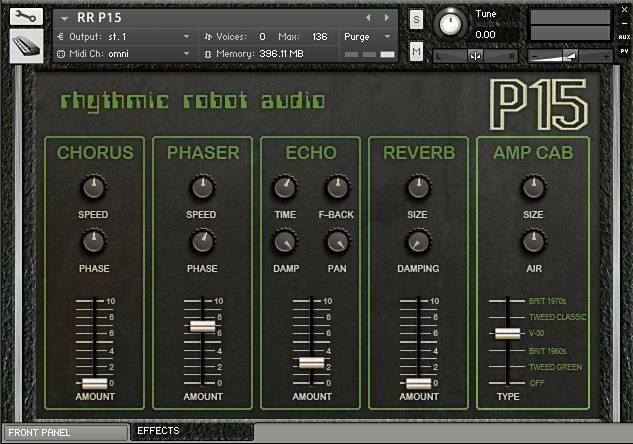 All in all, this unusual and hard-to-find little synth really comes into its own when played polyphonically, especially with a whole fistful of Presets engaged at once. In fact, whole worlds of low-budget 70s science fiction are yours to command, and more besides. With the vintage authenticity switched off you can get surprisingly lush textures out of it by combining waves – stuff that really would have seemed cutting edge back in the 70s. All this, and Italian styling too…! What’s not to love? A smooth-sounding synth that I’ve found very handy for pads/ambience and soft, organ-like tones. Thank you Professor and Mongo! 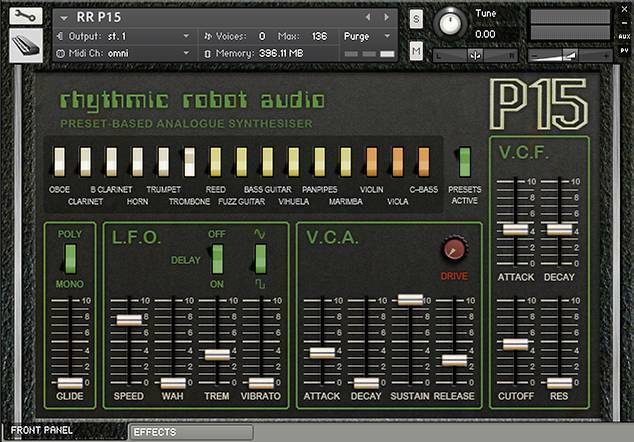 With a little jiggling I got a nice whistling synth sound like at the end of Emerson, Lake & Palmer’s “Lucky Man”. I’m pretty rudimentary when it comes to sound design, but these RR instruments are little universes ready to be explored and I’m taking tentative step into this. A kick in the head. You guys make some very nice sounding libraries at a very affordable price! The GUI on all the libraries I own are very cool and functional. 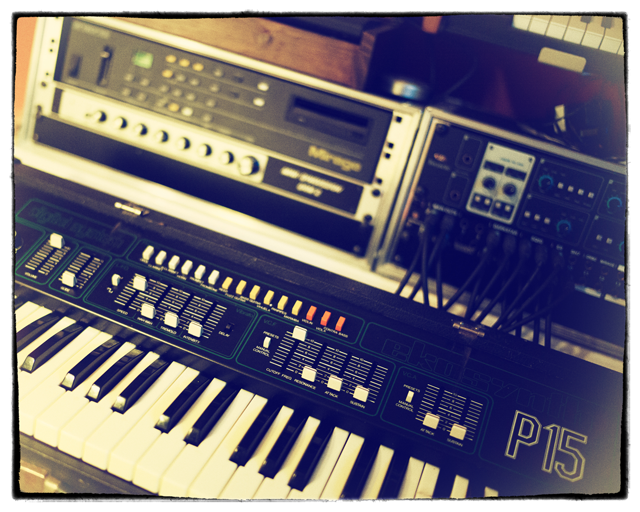 My most recent purchase was the P15 synthesizer. I’m really enjoying and have used the sounds on 3 tracks I have produced so far. Keep up the great work! I think I bought this on the day that it came out; or wait, maybe on the day after that. This is an AWESOME instrument. As a purist of vintage keyboards myself, I never thought I could end up taking so much advantage out of the “modifications” that are introduced in Rhythmic Robot’s KONTAKT version. But they’re even ever so cool; how can you NOT play this EKO P15 poliphonically or use the multi-osc sources once you are able to? Congratulations Professor (and Mongo…) ! !.